If the Conservative record is assessed throughout their years in power, why does the analysis of Labour's performance stop at 2007? The purpose of the article, if you hadn't realized, was to discuss Labour fiscal policy prior to the financial crisis. My comment was directed at the last paragraph, its declared purpose being to assess whether Gordon Brown was profligate. How convenient that the comparison excludes Brown's disastrous last couple of years, yet includes the entire period the Conservatives were in office. So GB showed no signs of profligacy until the global financial crisis, but because the deficit increased as a result of that crisis he was profligate. That is just silly. Indeed that would be silly, but no such inference can possibly be drawn from my previous comment. I was just hoping for a fair comparison between the two parties records. Although you make the point that the UK economy in 2007 was "pretty close to trend" surely such an uncommonly long period of expansion might have given rise to caution? Of course that wouldn't apply if you believe you have abolished "boom and bust." Also noteworthy is the fact that government tax receipts declined markedly in 2008/9 & 2009/10. 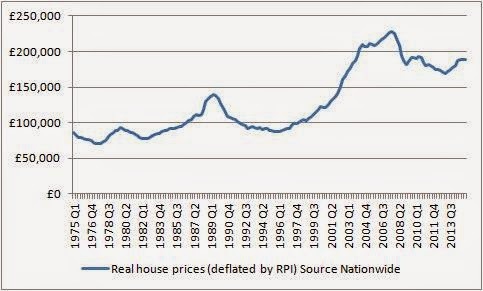 This does not seem to have occurred in the recessions of the early 80s and 90s. Is that not evidence that tax receipts (in 2007/8) were particularly high based on an unsustainable level of contribution from a then booming financial sector? Stephen, Brown was attempting to run a Keynesian stimulus during a severe economic downturn; that is not gratuitous spending. You can argue against Keynesian or Hicksian principles but not attack Brown for spending without reason.